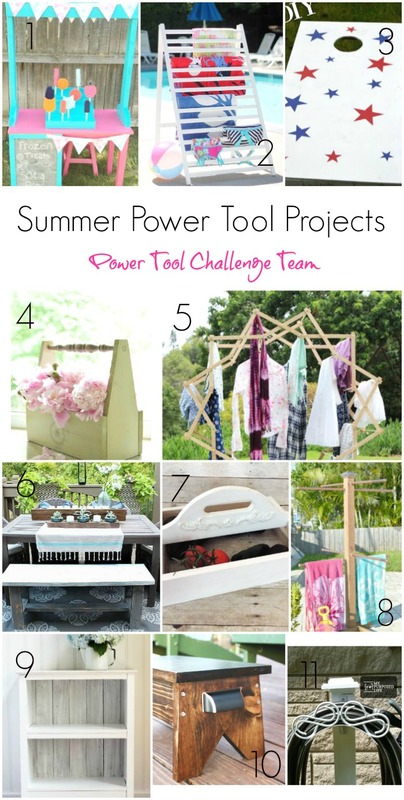 It's time for the monthly Power Tool Challenge and the theme this month is Summer. In the March challenge, I shared how I turned an Antique Pressed Chair Back into a Bird Feeder. Well for this month's challenge I dug back into my bucket of chair parts to inspire me for this project. 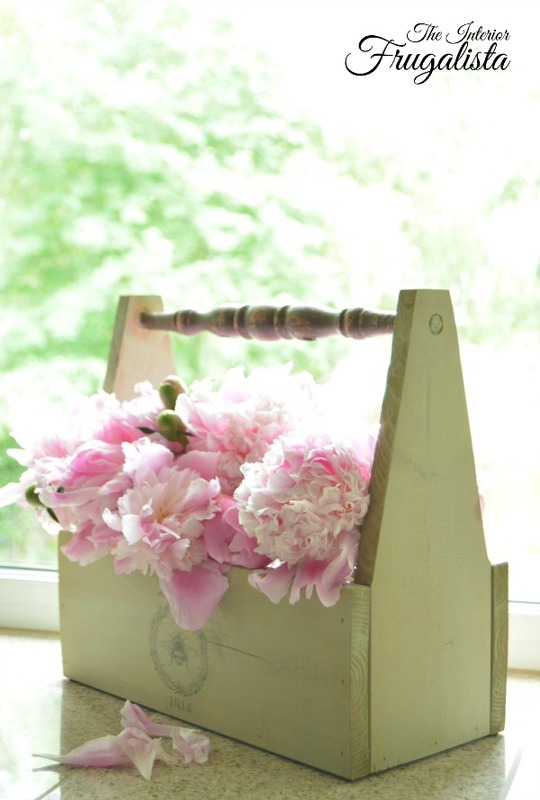 My project this month is an Antique Chair Spindle Wooden Garden Caddy. I should say, cadd(ies) because I made four of them, of which three sold at the outdoor market in May. 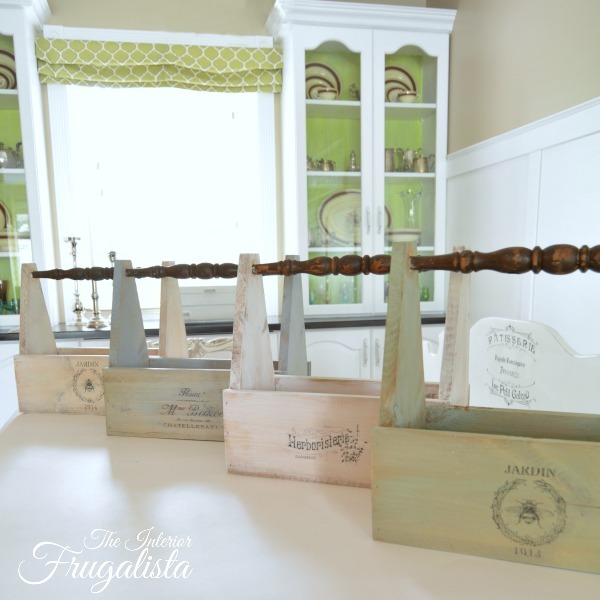 The Power Tool Challenge is a monthly series where several female DIY bloggers come together to share a project they made using a power tool(s). 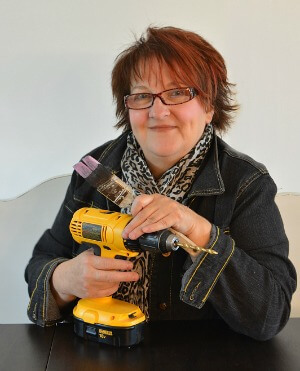 The goal is to inspire, motivate, empower, and challenge our female readers to step out of their comfort zones and try one of our projects using a power tool. 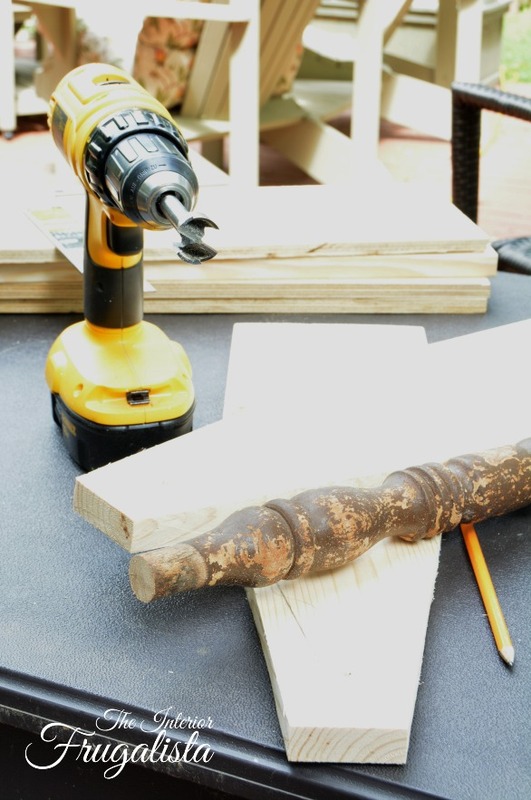 Perhaps you are already comfortable with certain power tools but want to expand your repertoire or overcome a fear of a certain power tool. I didn't invent the wheel with this project. 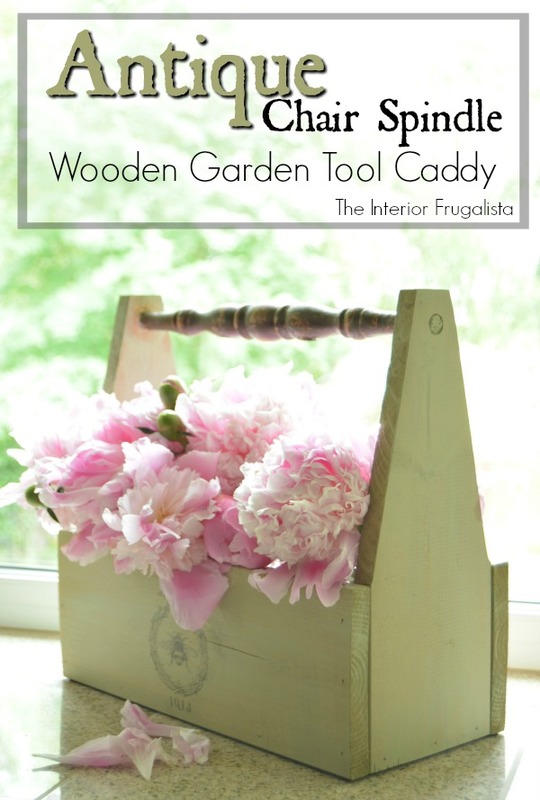 You can find wooden tool caddies all over the blogosphere and Pinterest but I have a goal to achieve. To get to the bottom of my bucket of antique chair parts by the end of the year. If you missed my project in the March challenge, you can see how I repurposed an Antique Chair Back Into A Bird Feeder. 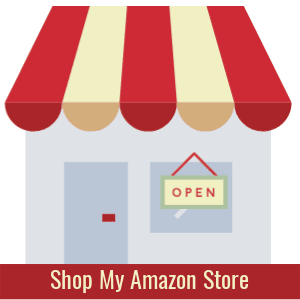 *affiliate links are included in this post so you can see the products or similar products that I used. See my disclosure policy. 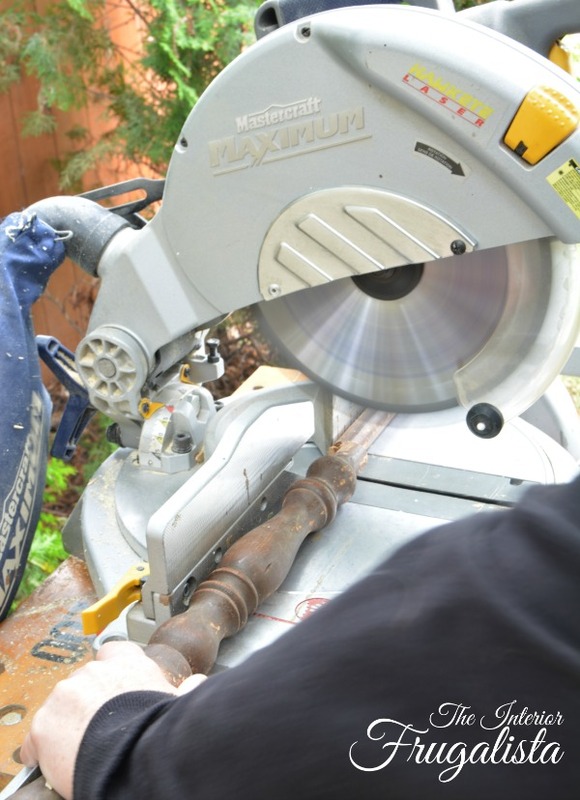 Read your power tool operating manual and safety guide. Using the miter saw I cut just a snippet off each end of the antique chair spindle just to straighten and clean up each end. It took 1 8-foot pine fence board to build each wooden caddy. I cut them using a miter saw (except for the angle cuts which we'll talk about in Step 3. Note: My antique chair spindle determined the length to cut the front and back pieces. 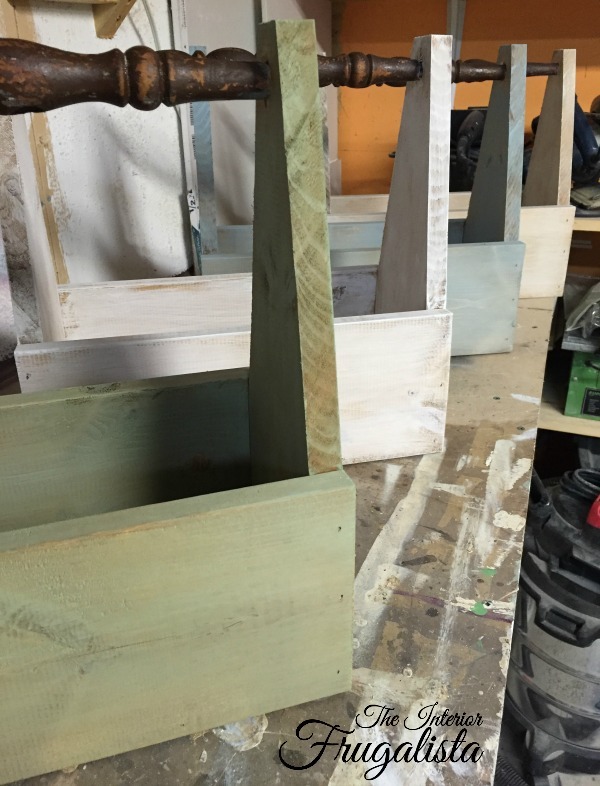 Sides: 5 1/2" x 14"
Front & Back: 5 1/2" x 15"
Bottom: 5 1/2" x 13 1/2"
Mark the center of the top of each side piece. Measure 3/4" on each side of the center mark - making the top a measurement of 1 1/2" wide. From the bottom of each side piece, measure up 5 1/2 inches both sides. This equals the height of both the front and back pieces. Using a straight edge, draw the angle on both sides of each mark (like in the picture above). 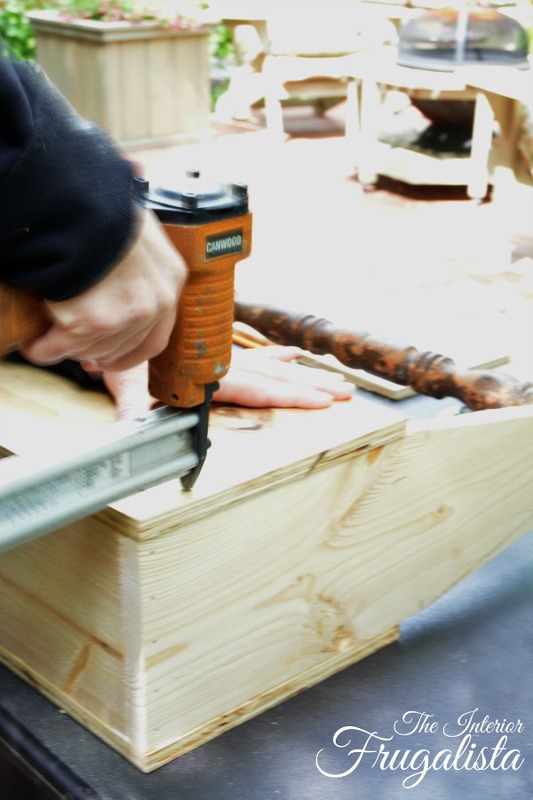 Clamp the board securely onto a work table and cut the angles using a jigsaw. 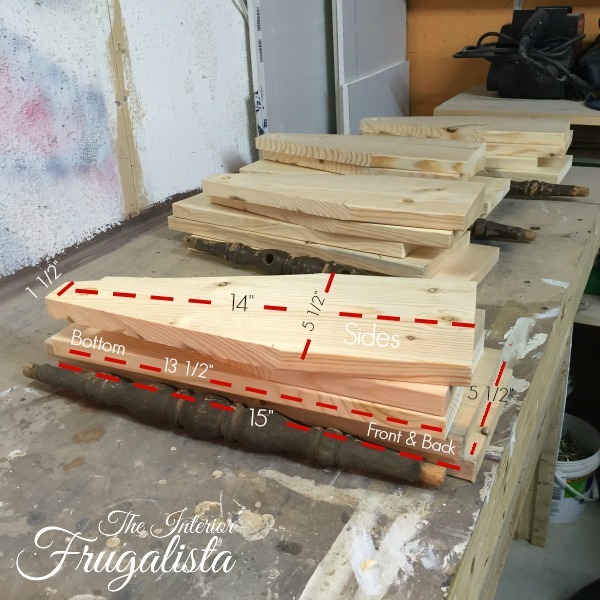 Note: Using a Bandsaw for these angled cuts would be ideal as you get a more uniformed cut. It is on my Must Have List for our workshop. Find your center mark at the top of each side piece. Measure and mark 1 1/4-inches down from the top. Using a 1/2-inch Forstner Drill Bit (like pictured above) place the tip of the bit on the mark you just created. Drill the hole for the spindle handles. Tip: For a nice clean cut on both sides of the board, drill until just the tip of the drill bit is poking through the other side. STOP the drill and check with your hands - repeat until you can feel it poking through. 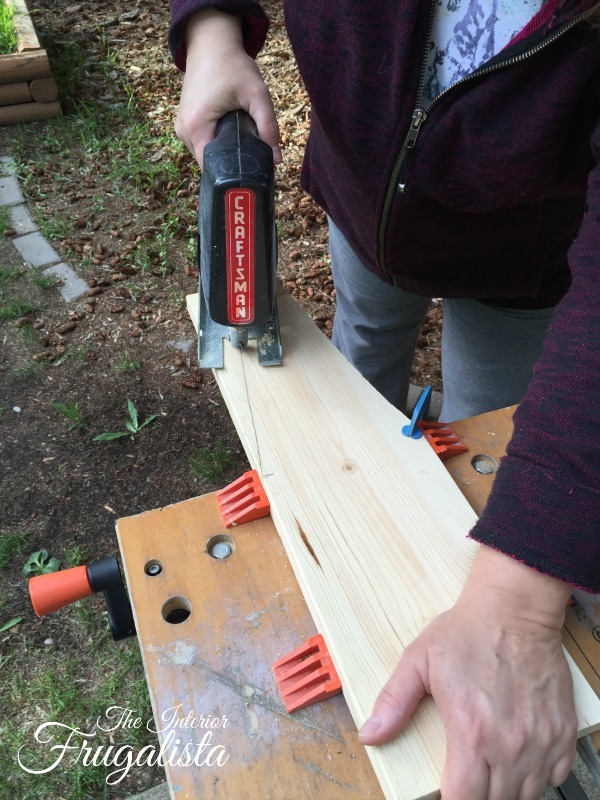 Remove the bit, flip the board over and drill until you are all the way through. My apologies for the blurry picture. Those of you with a keen eye may notice in the picture above that I'm nailing a plywood front, rather than a pine. 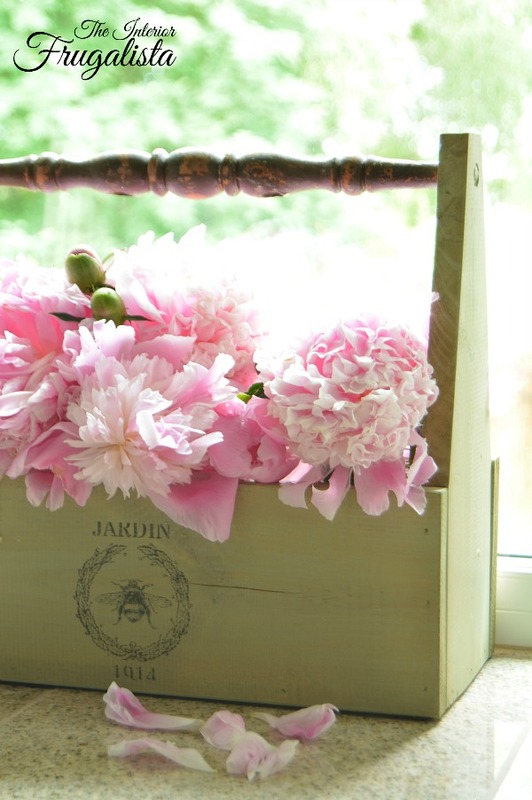 Truth be told, this is a photo from another, much larger, wooden tool caddy that I built for my daughter's wedding (I'll be sharing that project after the wedding). I completely forgot to take a photo while assembling the garden tool caddy. Regardless, you can see that they are assembled using a brad nailer with 1 1/4-inch brad nails. 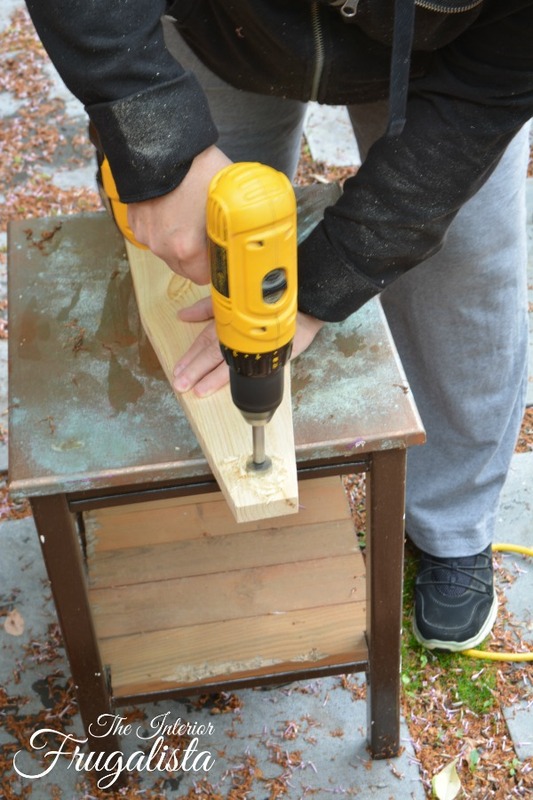 Apply construction glue to the base of one side piece and nail it onto the caddy base. Apply construction glue to the inside of the hole for the handle. Insert the chair spindle into the hole. Apply construction glue to the inside of the hole on the second side piece. Feed the chair spindle through and nail the side piece to the caddy base. Nail the front to the base and side pieces, ensuring everything is lined up nice and straight. That's it, your caddy is assembled! Now onto the fun part, painting and decorating the garden caddy. 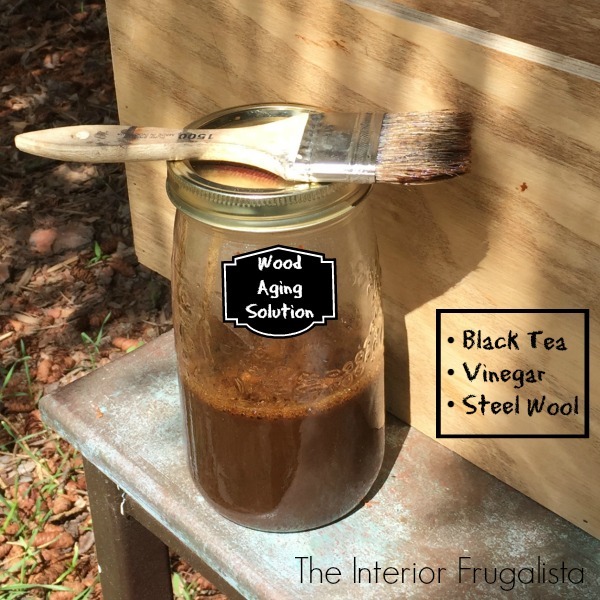 For a detailed tutorial on how to age wood naturally, visit my How To Age New Wood With Stuff From The Pantry tutorial. You can see I painted each of my Garden Caddies a different color. 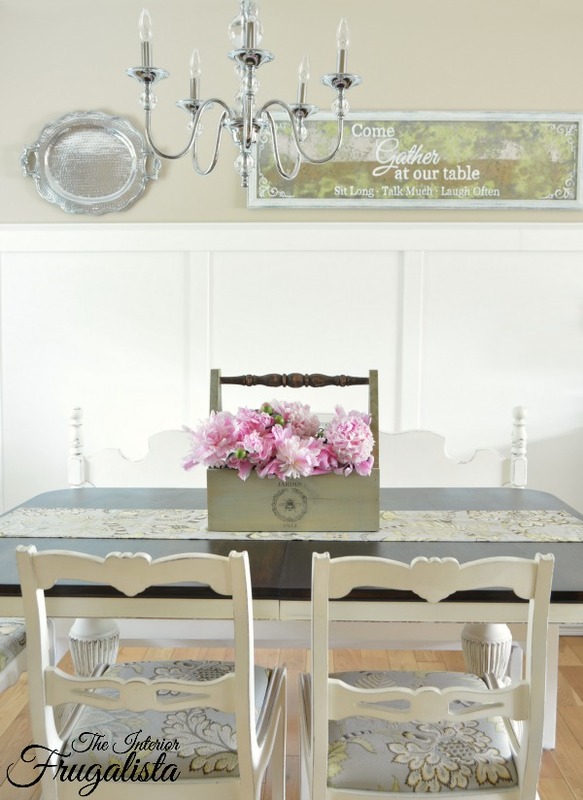 The one I'm sharing with you today is in the color Sage Advice by Country Chic Paint. I dipped the tips of my brush into a bucket of water first and then into the jar of paint. Applying very little pressure I brushed the color over the aged wood. It gives a semi-transparent appearance so the wood underneath shows through. With a damp clean lint free rag, I removed some of the paint in areas. 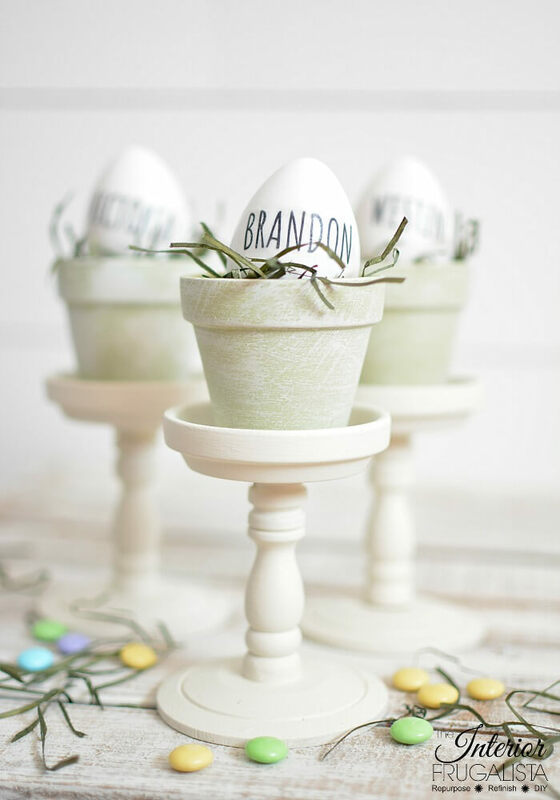 The colors of the other caddies are; Simplicity White (cool white), Vanilla Frosting (warm white), and Elegance, all by Country Chic Paint. I went to The Graphics Fairy website and downloaded the Jardin 1914 graphic. 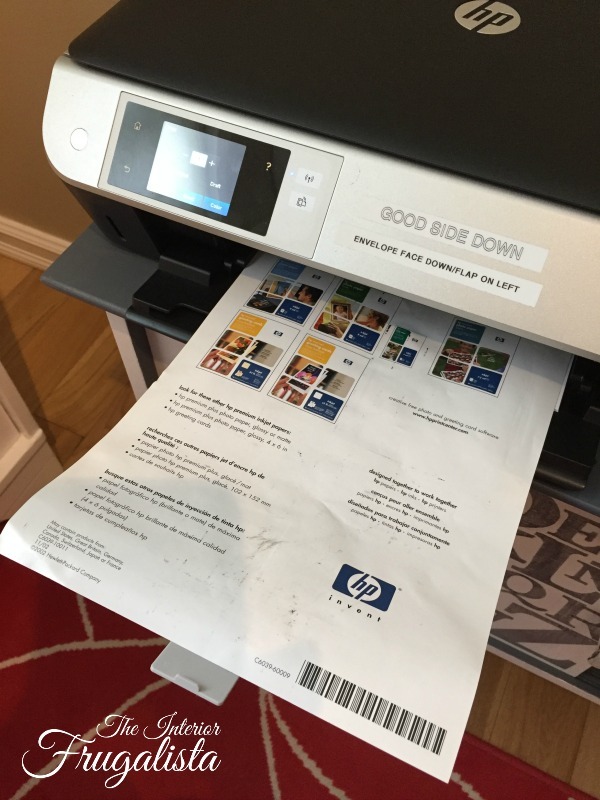 Note: To use this particular image transfer method you will need an inkjet printer. Print the graphic in reverse (mirror image) onto glossy paper (see picture below). 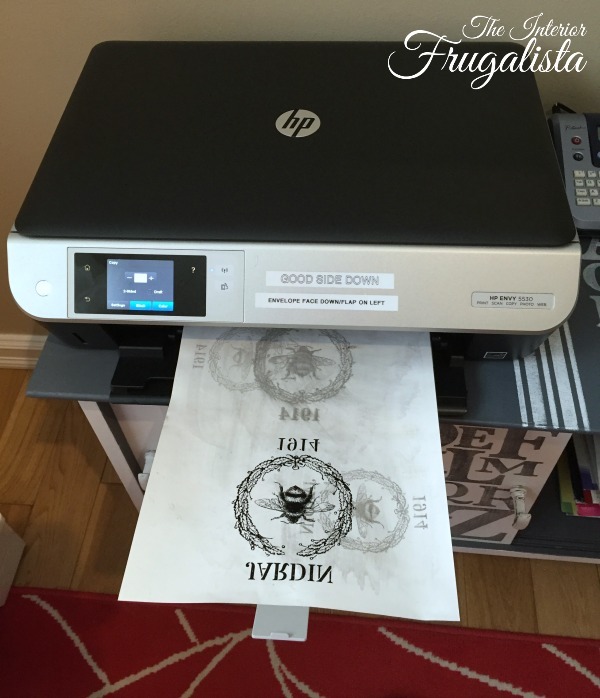 Tip: I keep the glossy pages from packages of special printing paper for this purpose. Sheets from labels also works - remove the labels and use the paper. I find the glossy paper provides a better transfer. Print the graphic on the glossy side of the paper like pictured below. You can see that I use the same sheet over and over, wiping whatever ink doesn't transfer off with a damp paper towel. Line the graphic up onto the front of the wooden caddy (being careful not to move it around to avoid smearing the ink) and tape in place. Using the back of a spoon, rub the graphic onto the wood. It took a lot of rubbing to get a good transfer so keeping checking underneath before removing the tape. After the ink has completely dried, I waited for 24-hours, apply clear wax with a lint-free rag to protect the wood. The wax really brings out the paint color too. 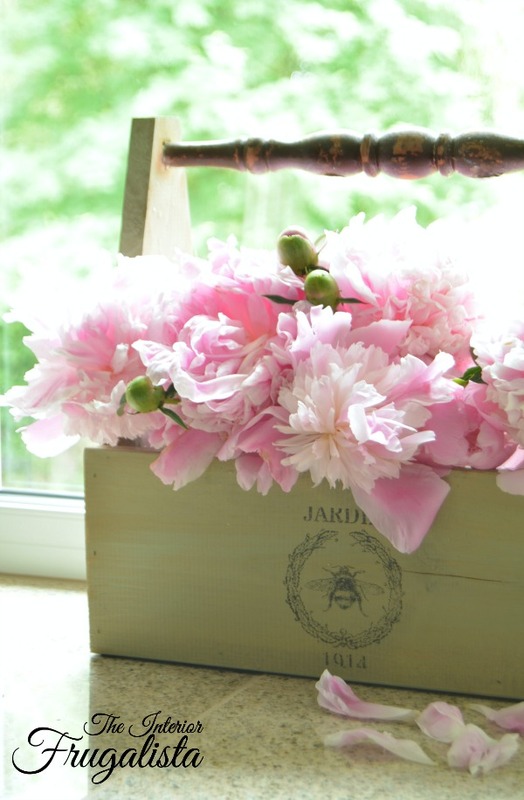 I couldn't resist placing four medium sized mason jars into my garden caddy and filling them with fresh cut pink peonies from the garden. 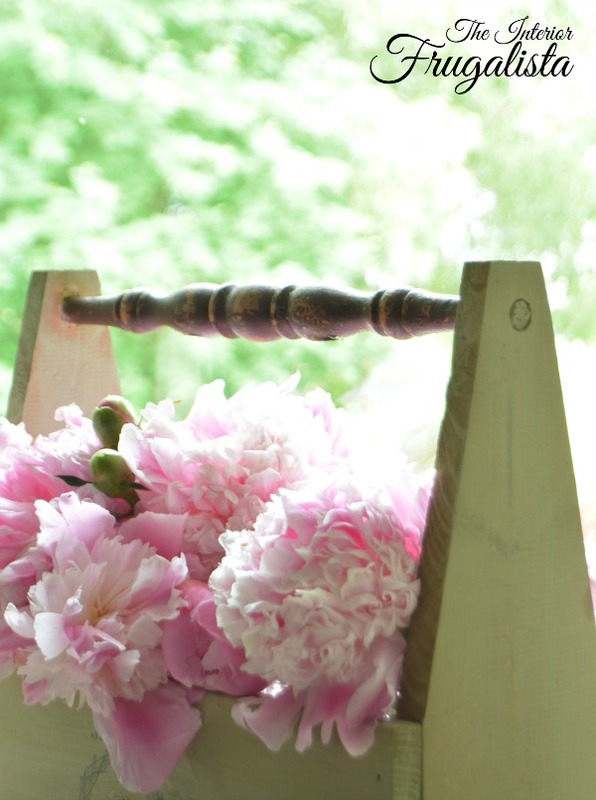 I think the Antique Chair Spindle Wooden Garden Caddy looks beautiful on my dining room table. 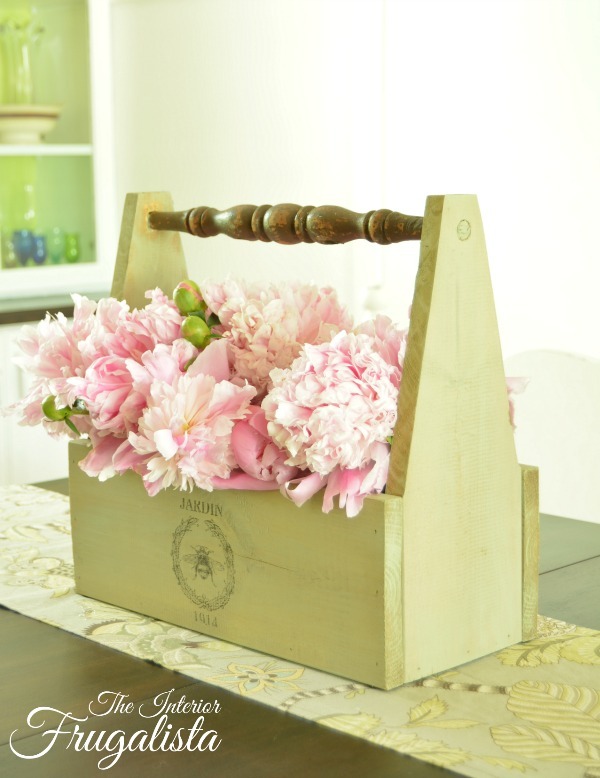 So what do you think, would you try making a wooden garden caddy for your home? Time for more inspiration! Press the links below to see what my talented friends in the Power Tool Challenge Team created for their Summer projects.